Blocks are the latest offering from ROLI, a company best known for its ground-breaking multitouch-sensitive keyboards, the Seaboard Grand and Seaboard Rise. 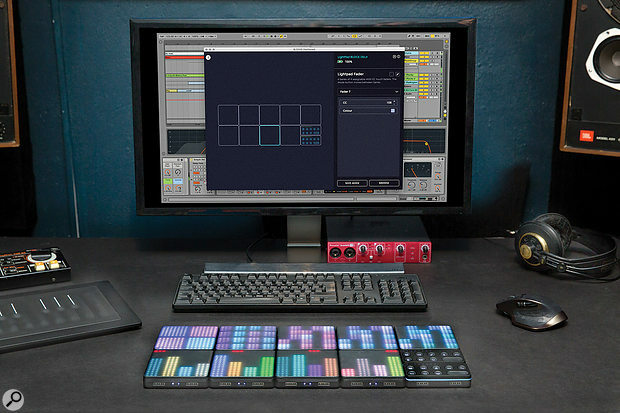 Although the blocks arrive at a more affordable price, they share much of their heritage with the larger Seaboard devices: the technology is multitouch capable with velocity (attack and release), pressure and continuous X-Y position sensing, a system ROLI refers to collectively as ‘5D’. As I was writing this review, ROLI were in the process of rolling out further additions to the blocks family, both hardware and software, and by the time you read this there will almost certainly be newer family members — the blocks story appears to be far from over. Accordingly, I’ll cover the products so far in chronological order of release. The first set of products was a group of three small devices (the Lightpad Block, the Live Block and the Loop Block), Bluetooth-enabled controllers designed to work with Noise, an iOS and (coming soon) Android synthesis and looping application. Then came Blocks Dashboard, a Mac/Windows application allowing blocks to be configured and programmed to operate stand-alone or in conjunction with a DAW. Finally, ROLI released the Seaboard Block, a miniature Seaboard keyboard, alongside a new Touch Block for changing touch response on the Lightpad and Seaboard. Software-wise the Lightpad and Seaboard blocks come with Equator Player, a preset version of ROLI’s high-end soft synth. 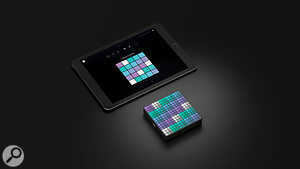 The Lightpad Block, connected to Noise on a phone or tablet via Bluetooth, is an entry-level mobile performance system. Add a Live, Loop or Touch Block for additional controls. The Seaboard Block does everything the Seaboard Rise does, in a smaller package, though it is missing some controls. It can play Noise over Bluetooth, or the Equator soft synth via Bluetooth or USB. 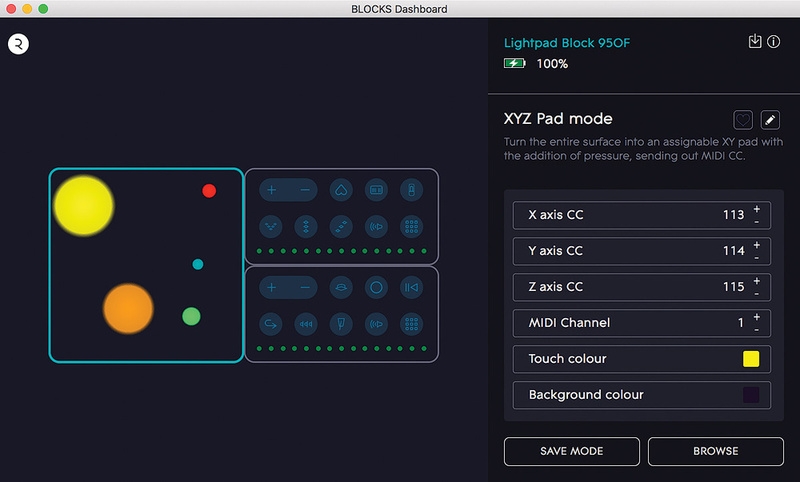 Blocks Dashboard lets you configure blocks, or even write your own programs for them to run as stand-alone MIDI controllers. The Lightpad and Seaboard blocks are MPE-capable controllers, and can be used to play instruments in DAWs that are also MPE-aware, such as Bitwig Studio. The Seaboard Block is bundled with the MPE-capable Tracktion Waveform DAW. Equator can run stand-alone or as a VST or Audio Unit. In an MPE-capable host it supports polyphonic expression; in a non-MPE host (like Ableton Live) it’s possible to get the same effect rather awkwardly using multiple MIDI tracks (as was outlined in the Seaboard Rise review in SOS February 2016 issue). 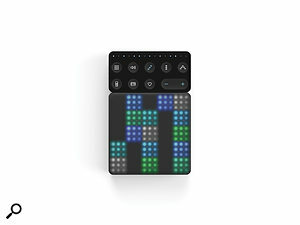 One of ROLI’s aims with the blocks is affordable, accessible, portable, expressive music making. While not quite in Christmas cracker territory price-wise (unless you habitually shop at Harrods), the costs compare well against mainstream consumer electronics (the most expensive block is less than half the retail price of an iPhone 7). And as I type this, blocks are being shipped to Apple Stores all over the world, which gives them every chance of becoming mainstream for non-professional music making. (The Seaboard Block will see distribution through Apple Stores as well as more music-oriented channels.) ROLI claim that blocks open up music making to everyone, regardless of training, and they’re certainly portable, being Bluetooth enabled, battery powered, and fitting neatly into backpacks or even coat pockets. Not all blocks are created equal. The Seaboard Block is the flagship controller of the range, and measures up at about 11-inches wide, five and a half deep and three quarters thick. 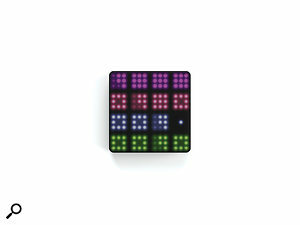 Next down in size and price is the Lightpad Block, a multitouch-sensitive surface backed by a 15x15 grid of full-colour LEDs, and measuring about three and a half inches square. The other smaller ‘control block’ models — the Live Block, Loop Block and Touch Block — are subsidiary to the Lightpad and Seaboard, and can’t really be used without one. The blocks system is modular: a Seaboard or Lightpad Block will get you started, a second one will expand your playing capabilities, while one or more control blocks will make some tasks easier and open up more performance possibilities. Like the Seaboard Rise, the blocks are not sound generators, and need to be connected to a dedicated synthesis engine or other software to be usable. 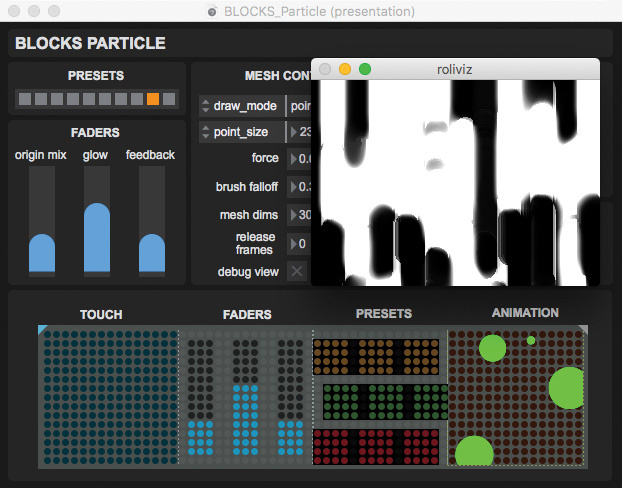 Firstly, blocks are deeply integrated with Noise, ROLI’s free audio app for iOS. Noise can also be used with the Seaboard Rise, and internally has the same Equator sound engine as the one that runs natively inside the Seaboard Grand, so in terms of synthesis and overall sound quality there’s no compromise for portability. 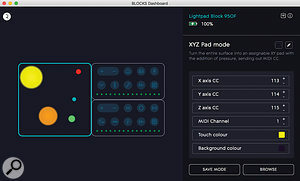 The blocks serve essentially as dedicated control surfaces for Noise, and don’t offer any features you don’t have if using Noise directly on your iPhone or iPad. But just as a physical keyboard is more accessible and productive than any on-screen keyboard you might find inside a DAW, blocks are intended to bring an easy, immediate performance interface to Noise. 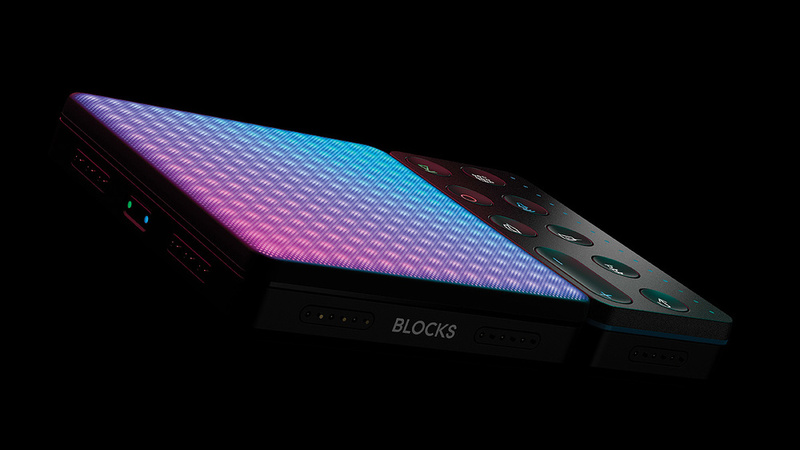 From a technical point of view, the blocks are just MIDI controllers, interfacing wirelessly over Bluetooth. We’ll look at using the blocks with other software later in this review. I was initially shipped one of each of the first editions of the blocks (Lightpad, Live, Loop) for review. (A pair of Seaboard Blocks and a Touch Block arrived some months later when they became available.) The packaging befits their Apple Store placement: they are boxed almost identically to iPhones, and come with minimal printed documentation. The enclosed Quick Start Guide gives an outline of the buttons and connectors, and then instructs you to download the Noise app and continue from there. The blocks are nicely constructed, and there are no obvious screws or clips: ROLI are clearly following Apple’s design aesthetic here. (The internal batteries are rechargeable, but there’s no obvious way to replace them.) The casings are black ABS, and while the Lightpad Block’s touch surface is silicone and polyurethane, the control blocks have a solid top surface of anodised aluminium. The Lightpad Block (with Loop Block attached) presenting a 5x5 keyboard.The Lightpad Block is the most complex unit. All of its controls are around the edge: a power button (with Bluetooth and battery indicators), a mode button, a USB-C socket (for charging and MIDI), and an intriguing collection of metal pins all the way round, arranged into two groups on each edge. The control blocks have backlit rubber buttons on top, as well as a row of small LEDs, while their edges sport the same metal pins as the Lightpad. The control blocks are exactly half the area of the Lightpad, and so have two sets of pins on each long edge and one on each short edge. There are no USB or power sockets or any side buttons on the smaller units: they are turned on by attaching to a Lightpad or Seaboard Block, and turned off by holding down the top-left mode button. I wasn’t very keen on the feel of the control block buttons, which are slightly recessed rubber. It wasn’t clear whether they were supposed to have a definite click when pressed (some did, some didn’t), and I’d have preferred something requiring less pressure and offering more feedback. However, the Touch Block, which arrived most recently, had a more responsive feel to its buttons, so perhaps design improvements are being made. ROLI call the groups of pins on the sides of the units DNA connectors, and they’re used to dynamically connect blocks together into larger control surfaces. The connectors are magnetic, and carry power and data between physically connected units. This is why any blocks setup must contain at least one Lightpad or Seaboard: these units can be charged over USB, but the control blocks can only be charged via another block. Since all the blocks have DNA connectors on several edges, there’s a huge number of possible physical layouts: the Lightpad can have control blocks on any edge, any way up, and the control blocks can be stacked together. The Lightblock does have an orientation: the various keyboard layouts assume the USB socket is at the top, although you can accidentally (or intentionally) cover this socket, or the side buttons, by attaching other blocks. The USB socket on the left side of the Seaboard Block is positioned such that the DNA connector there can’t be used when a USB cable is plugged in, which seems like a careless oversight. All blocks have Bluetooth, so once charged they don’t actually need to be physically connected to each other, or anything else. Standby battery life is quoted at several months, but my units did have a habit of discharging over a day or two, until I updated to the latest firmware. As the DNA connectors let you distribute power across multiple units, everything can be kept topped up at 100 percent charge over a single USB connection. The Lightpad Block mirrors the grid presented by the Noise app.The Lightpad and control blocks are primarily designed to integrate tightly as controllers for the Noise app, and the performance, control and display functions they provide mirror those in the app. In particular, the Lightpad Block provides a multitouch surface and grid display that duplicates what the app presents on an iPad or iPhone screen. It follows that a review of the entry-level blocks ‘software’ is basically a review of Noise, and since Noise also works without blocks a lot of what I have to say applies to the app when used on its own. For the moment I’ll stick to describing blocks as an entire system, with the understanding that much holds true if you only have the app. To use blocks and Noise together, start by Bluetooth pairing a Lightpad Block within the app. Once the Lightpad is turned on, it’ll appear in the app’s Bluetooth settings under ‘Connect a Block’. Every block is initially identified by a code derived from its serial number, so if there are lots of blocks in your immediate vicinity (such as, say, at a product launch event) you’ll have to remember the code, unless your eyesight is good enough to read the tiny grey print underneath the unit. (You can later rename the block using Noise.) 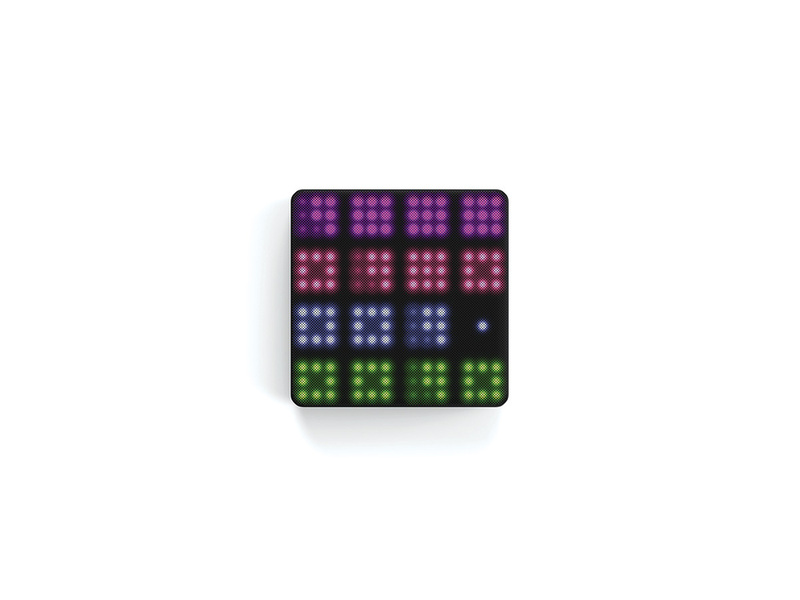 Once paired, the Lightpad will display a multicoloured grid of some description, corresponding to the grid displayed by the app. Control blocks can be paired in the same way. (An unpaired control block will show an array of small LEDs denoting battery charge that turn off when it’s paired.) But here’s where the networking gets a bit more sophisticated: attach a control block to a paired Lightpad Block via the DNA connectors and the control block will also come online, connected to the app, using DNA for data communication rather than Bluetooth. While ROLI recommends against the practice, it appears that control blocks can be attached or detached whilst in use, falling back to Bluetooth (if paired) when not physically connected. Connect everything by DNA and a single USB socket, and all the batteries will remain charged during use. The DNA connection scheme worked better than I might have expected, but it did seem a bit finicky: sometimes a block would need to be power-cycled, or disconnected and reconnected, before it came online. (Subsequent firmware updates did improve reliability considerably.) Also, Noise will report a DNA-connected device as ‘offline’ for Bluetooth, which is misleading. But once up and running, everything seemed pretty stable. Once everything’s connected up, we’re ready to play. Noise acts as a four-part synthesizer/clip looper, with the Lightpad Block accessing a drum part and three melodic synth parts, and also doubling as a simple touch-sensitive mixer with VU display. The Live Block controls note playing, while the Loop Block is in charge of looping, recording and playback. The drum part might display as a traditional 4x4 grid of drum pads, or in some cases (bongos, taikos) as a 2x2. Melodic parts are presented as a 5x5 isomorphic keyboard. Depending on scale setting, accidentals might be present as well (as unlit pads). The mode key on the edge of the Lightpad Block cycles between parts; each control block also has a dedicated mode button with the same effect. To switch between presets for any part, use the multi-function +/- buttons on a control block. Every preset has its own colour palette. Let’s look at drums first. The presets are divided into ‘drum kits’ and ‘groove kits’. Roughly speaking, a drum kit provides a single hit per pad, while a groove kit equips each pad with a complete multi-sound rhythm pattern. Groove kits have their own free-running internal sync, so hit and release a groove kit pad too quickly and it’s quite likely you won’t hear anything. Things get more complicated when we look at the Lightpad’s velocity, pressure and location sensing. Sustained pressure and finger movement warp the basic sounds in different timbral directions, adding a variety of modulation and effects depending on the preset. While drums aren’t known for their sustain, Noise’s drum sounds either contain a continuous sound component, which can be modulated, or come with some kind of internal delay line to add rhythmic or stuttered effects. And the patterns in the groove kits mutate into different forms depending on finger position. I’m reminded very much of my experiments with various models of Korg Kaoss Pad, or of the sounds I’ve heard coming out of a Korg Wavedrum. The Lightpad offers plenty of visual feedback. Active pads increase in brightness while other pads dim, and finger pressure and location are shown as visual traces the same colour as the triggered pad. I was pleasantly surprised at the sheer range of timbral material that could be generated from even a single drum hit — it’s obvious from listening that the sound engine is doing something a lot more sophisticated than playing samples into an effects processor. Because of this complexity, it would probably take quite a while to learn each individual kit, but every preset comes with a demo sequence, accessed via the Loop Block’s ‘learn’ button. If you’re used to the touch sensitivity of iPhones and iPads, it soon becomes pretty clear that the Lightpad Block is responding to pressure rather than touch, and playing sustained chord gestures in particular can be quite hard work, although holding the Lightpad in two hands and playing with the thumbs makes the device much easier to control. ROLI tell me that they’re still working on tuning the touch sensitivity of the device, and the Touch Block provides controls for altering touch and glide sensitivity, much as the dedicated left-hand controls on a Seaboard Rise. Bluetooth latency is quoted at 30ms, which is high for a conventional instrument but reasonable if you’re happy to accept that the Lightpad’s pressure sensing already implies some response delay. The current scale is picked out in blue and white LEDs on the Live Block.On to the melodic parts. On the Live Block, a dedicated octave button enables transposition up or down over six octaves (the LED row on the block helpfully indicates the current transposition). A dedicated scale button allows selection from 19 different scales: the LED row displays a scale octave and indicates which notes are in each scale. In this mode you really want your Live Block to be the right way up, with LEDs at the top, otherwise the scale display will be very confusing. As the scale changes, the pattern of illuminated key pads on the Lightpad follows suit. There are some keyboard features in the Noise app that aren’t accessible from the blocks: setting the root note of the scale, and a ‘hide notes’ switch that removes out-of-scale notes from the grid. For readers familiar with Ableton’s Push grid, ‘hide notes’ is equivalent to the Push’s default ‘in key’ layout. There’s a function for playing one-finger chords with a selection of voicings and intervals — all chords appear to have fixed chromatic intervals regardless of scale or key selection — and there’s an arpeggiator. The basic arpeggiation pattern can be selected on the Live Block, but again, settings like note gate, interval and octave repeat are available only in the app. The three melodic parts have independent chord and arpeggiator settings, which is a nice touch. Predictably, the melodic synth presets are more dynamic than the drums, with the kinds of modulation, filter and effects control you’d expect from a professional synthesizer. Each preset seems to come with its own reverberation effect as well, some of them quite wild (the ‘Slide into Wobble’ preset seems to have a gated reverb which is enabled only on note release, which is fun). And again, all the effects are local to the parts. Perhaps I’m being picky, but it would be useful to have a way to remove the generic reverbs when using Noise for recording into a DAW. The Noise app provides a loop-oriented, clip-based recording interface, with clips laid out in grids of four by four: each row is a different synth or drum part, with individual loop slots along the row. Overall there are 12 slots per part, making three grids. An iPad can display all three grids side by side, while an iPhone, and the Lightpad Block, can only display one grid at a time — you have to scroll between them, although loops from different grids can be playing at the same time. Loop slots in the sequencer.The app provides a swipe gesture to switch between the keyboard view for a part and the sequencer grid view, while screen buttons switch between the three grids. Curiously, there’s no interface on the blocks themselves for switching between the two modes, nor between grids: you have to go back to the app, which is irritating when you get into the flow of recording and re-recording loops. If you’re serious about playing and looping, the best option here is to budget for two Lightpad Blocks and have one in each mode. Occupied slots can be recorded over, but there’s no overdubbing, and no punch-in or out: you replace an entire recorded clip in one action. Also, slots cannot be cleared, but only over-recorded with silence. Although note gestures are replayed graphically, there’s no editing of clips after the fact: in that sense, Noise behaves more like a looper than a sequencer, although it can quantise. There is an indication of recording and playback position: the LED row on the Loop Block counts off the quarter notes, while any Lightpad pad corresponding to a playing clip shows a low-resolution rotary progress dial. Multiple ‘pages’ on the Lightpad Block provide a user interface to a video processing system.While the tempo is selectable (from 60 to 200 bpm), all loops are four bars long and in 4/4 time. And for accurate tempo settings, you’ll have to use the app: the tempo control on the Loop Block provides increment and decrement by intervals of about 10bpm. ROLI tell me that Ableton Link integration for Noise is forthcoming. When not connected to Noise, the blocks function as ordinary MIDI controllers, although the Lightpad Block, in common with the Seaboard keyboards, transmits MPE for multitouch pressure, pitch-bend and vertical slide. It’s worth noting here that most of the functionality of the control blocks is provided in software by the Noise app, so if you switch to a DAW or the Equator synth you lose the chord and arpeggiator features of the Live Block. Crucially, though, if a Touch Block is DNA-docked to a Seaboard Block it continues to provide multitouch parameter control regardless of the MIDI software being used. (The Live Block also continues to provide octave transpose with LED indicators.) For some reason, these ‘local’ functions of the control blocks don’t seem to work with the Lightpad — I’ve raised this as a bug with ROLI. With a Lightpad or Seaboard Block attached via USB or Bluetooth MIDI, you can just fire up Equator Player as a stand-alone app and you’re good to go. I won’t say much about Equator, since it was covered in the Seaboard Rise review, but it works fine with both Lightpad and Seaboard. I was initially a little disappointed to discover that the full version of Equator was only bundled with the Seaboard Rise (or more correctly, the editing functions in Equator could only be unlocked with a Seaboard Rise license), but ROLI have just announced an upgrade from Player to the full version for a very reasonable £49. If you’re happy with the Player version, it does provide a handful of macro edit controls for each patch. Finger sliding produces polyphonic timbre modulation, here mapped to filter cutoff in Bitwig’s Polysynth.The main DAW I have that supports MPE is Bitwig Studio, so I fired that up and plugged in the Lightpad Block via USB. The Lightpad is not yet supported in Bitwig specifically, so I pretended it was a Seaboard Rise, assuming that it would behave in a similar manner. The Lightpad duly displayed a keyboard showing a major scale. (The scale can be changed using the Blocks Dashboard, described below.) Once connected, the Lightpad works as a MIDI keyboard, supporting attack and release velocity, polyphonic pressure, pitch-bend and ‘timbre’ for vertical slide. Equator runs fine as a multitouch plug-in in this environment. Again, I found that I had to press quite hard on the Lightpad to hold multiple notes while sliding, and it was too easy to accidentally release notes, causing some re-triggering. Although I’m not too familiar with it, I did verify that the bundled Tracktion Waveform DAW also supports MPE (and Equator as a plug-in) without any obvious issues. The most comprehensive third-party support for the blocks comes from Cycling ’74’s Max graphical environment. A downloadable package provides a suite of Max objects to communicate with the Lightpad Block as a multi-touch display: Max-style controls such as buttons and sliders can be mapped onto on its surface, and it can even display images and video, albeit at very low resolution. Multiple Lightpads are supported, as well as ‘multi-pane’ switching on a single device. The control blocks are supported too, with full access to all their RGB LEDs. While the Lightpad can be connected via USB or Bluetooth, the control blocks must be docked via their DNA connectors. There is also dedicated support for the Seaboard Block. The Max package ships with some demo applications courtesy of ROLI: a multitouch video manipulator, an audio looper and a quirky little FM synth sequencer. Whilst not exactly gig-ready, these serve as varied tutorials for putting together applications of your own. One thing missing from the Max package is support for Max For Live: the blocks’ MIDI implementations are too complicated to let them be connected up to Max from within Live. The Dashboard software helps you keep track of systems like this. Blocks Dashboard is bundled with a small number of preset programs, mostly for the Lightpad Block. There are MIDI fader banks, an X-Y touch pad (well actually, X-Y-Z, since pressure is also converted to MIDI), and even a couple of games. And the standard melodic keyboard and drum pad programs are provided as well, since you may want to retrieve these configurations for DAW use. Three blocks attached to Dashboard, with an X-Y-Z MIDI Pad program loaded on the Lightpad Block.A program might present some configuration parameters in Dashboard itself. For example, MIDI fader programs have parameters such as MIDI channel and controller numbers, and some programs allow LED colours to be customised, or (in the case of the Live and Loop Blocks) button modes to be changed. Any saved changes cause a copy of the program to be stored in a User directory, separate from the Factory directory of preset programs. For the more adventurous, Dashboard allows totally new programs to be written. The programming language (called Littlefoot) is a simplified subset of the well-known C language, and all the bundled Dashboard programs (including the factory keyboard layout) are provided in source form, so they can be used as starting points. A couple of words of warning, though: firstly, the programming language and its libraries are still not that well documented. (As I write this, Dashboard is still in a beta testing phase.) Secondly, the blocks seem to have a tiny amount of onboard memory (in the order of a few kilobytes), so programs have to be relatively simple. Limitations aside, I found Dashboard to be pretty compelling as a platform for developing customised controller setups and then using them in other software. The Seaboard Block spans two octaves or 24 ‘keys’, C to B. This is one key short of the more common C-to-C of conventional keyboards, but it means that two or more units can be snapped together horizontally to form a single keyboard of four octaves or more. There are no left-hand controls — in fact the only additional playing controls are octave-up and octave-down buttons at the top corners of the unit — and there’s no obvious physical border around the key mechanism, so all note intervals are a consistent distance across a setup of multiple Seaboards. However, it’s not possible to play a note on one Seaboard Block and pitch-glide to another: the note will retrigger as you cross the boundary. New kid on the blocks: a Seaboard Block is added to the family. The horizontal key pitch of the Seaboard Block is about 85 percent of that on a full keyboard. I’m not a massive fan of mini keyboards, mainly because the ones I’ve encountered aren’t that mechanically robust, but the Seaboard Block feels solid, and I didn’t consider that the smaller-than-standard key size was much of an impediment, although it is harder to reliably pick out intervals without looking down at your fingers. On the other hand, I felt that the scaled-down keyboard might help when applying glide and pressure to notes, since the fingers are less extended. ROLI were kind enough to loan me a Seaboard Rise so that I could do a side-by-side comparison of the two models. In terms of the playing surface, the Seaboard Block has a slight roughness to it, whereas the Rise is smooth. The ‘keys’ on the block have a flat ridge on top which is wider than on the Rise, even though the key pitch is smaller; it’s not obvious why this is the case (perhaps some design constraint) but it doesn’t seem to affect playability. When playing both Seaboards together into the same Equator patch, with default sensitivity settings, the Rise appears more sensitive to touch, but it seems easy enough to tweak the pressure-sensing curve in Blocks Dashboard to get both units responding to the same degree. The rest of the 5D sensing seemed pretty equivalent between both models. The lack of left-hand controls on the Seaboard Block is a drawback, and clearly the Touch Block is intended to address this. It provides sensitivity controls for attack and release velocity (‘strike’ and ‘lift’), left/right glide, up/down slide and pressure. Where the Seaboard Rise has dedicated touch faders, on the Touch Block you need to hold the ‘+’ or ‘-’ button and wait for the value to scroll up or down, which is rather irritating, but at least there’s a dedicated button for toggling a ‘piano mode’, which turns off glide completely. It is puzzling that the position of the Seaboard Block’s USB socket stops you attaching a Touch Block to its left DNA connector at the same time as a USB cable — you’ll have to live with the control block at the top or right. I would hope that a Lightpad Block could be programmed as a touch control interface and attached to the left of the Seaboard, which could be a more powerful setup; USB power could come in via the Lightpad. At this stage I’ll refer you to the review of the Seaboard Rise for more information about the Seaboard instrument in general, and will look at how the Seaboard Block fits into the blocks ecosystem. The Seaboard Block is supported by the latest version of the Noise app. The two side-by-side Seaboards I have happily connected by Bluetooth and DNA respectively, and were routed to two melodic parts within Noise. A ‘Smart connections’ option determines whether side-by-side Seaboards are treated as a single keyboard or separate devices. As on the Lightpad, the mode switch cycles around the parts, though if the Seaboards are attached to each other only one mode switch is accessible. As the number of blocks in my testing setup reached six, I found the Dashboard application became much more useful in showing exactly how everything was connected together, especially as the control blocks had a tendency to switch off if there wasn’t a DNA connection for power. It’s worth noting that any blocks attached in Dashboard are not available over Bluetooth to Noise — it’s one or the other. As I write this there’s only one Dashboard program available for the Seaboard Block (the ‘Factory Program’), but this has a few configuration parameters, such as whether to enable MPE mode or not, and how many MIDI channels to use for it. 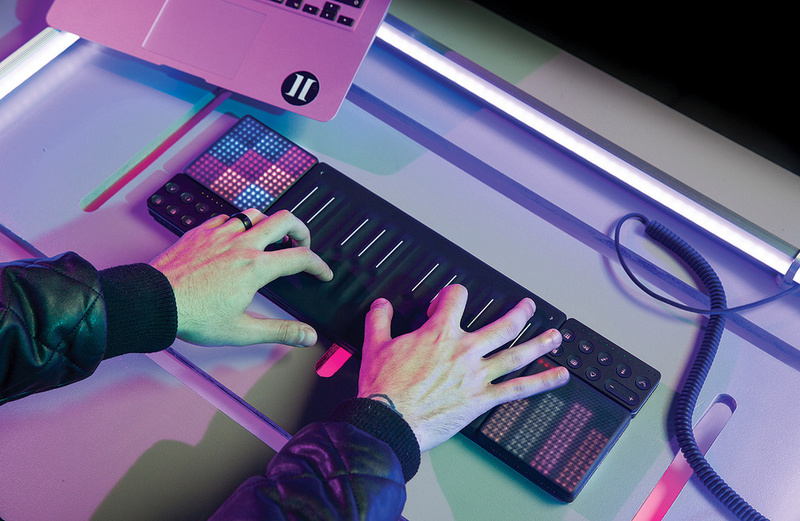 ROLI’s blocks mark a bold and intriguing new direction for a company known for its professional-level multitouch keyboards, aiming at a bigger market and attempting to democratise music-making. It’s good to see the company’s multitouch gestural interface design make its way into more affordable products. The Noise app, while limited in its scope, provides easy access to a powerful, expressive sound engine, whilst beyond Noise the Lightpad and Seaboard blocks integrate well as multitouch controllers in MPE-aware DAWs, and Equator offers a top-class multitouch instrument. For those truly on the frontier, blocks support in Max is comprehensive and highly extensible, and Blocks Dashboard allows custom programs to be written to run on the blocks themselves. The Seaboard Block is well constructed and there’s no obvious compromise in quality compared to the Seaboard Rise, so long as you’re happy with the smaller key size and the lack of dedicated left-hand controls. If you want the full version of the Equator synth for it it’ll cost you another £49, and it’s perhaps worth adding a Touch Block for tweaking touch parameters. The architecture of the blocks system (DNA connectors, Dashboard software) is ambitious but works reasonably well; operational glitches are irritating but minor, and are being actively addressed by firmware and software updates. Overall, the blocks system as a whole is pretty stunning at this price. 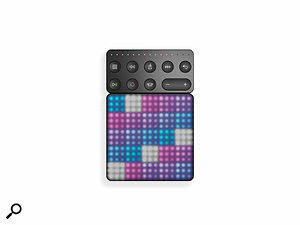 The Lightpad, control block and Noise combo is an impressive portable system, and is let down (for me) only a little by rather weak touch sensitivity, and omissions in the sequencing/looping system; but the ability to program the Lightpad makes that block in particular very appealing as a pocket multitool for MIDI studios and performance rigs. The Seaboard Block really raises the blocks ecosystem to a higher level, bringing ROLI keyboard technology in at a very affordable price. For a full evaluation, I do urge you to get along to an Apple Store to try them all out for yourself. High-quality, expressive, multitouch-aware synthesis engines. Groove kits are responsive and versatile rhythm generators. Bundled software (Equator Player, Tracktion Waveform). Comprehensive support in Cycling ’74 Max. Added potential for custom programmed behaviour and display via Blocks Dashboard. Some Noise app features not accessible from the blocks. Pressure-sensing results in a bit of latency. Lightpad touch sensitivity could be improved. No left-hand controls on Seaboard Block. Noise sequencer/looper is a bit lacking in features. Full version of Equator is an extra cost. No support in Max For Live. Android support for Noise still limited. 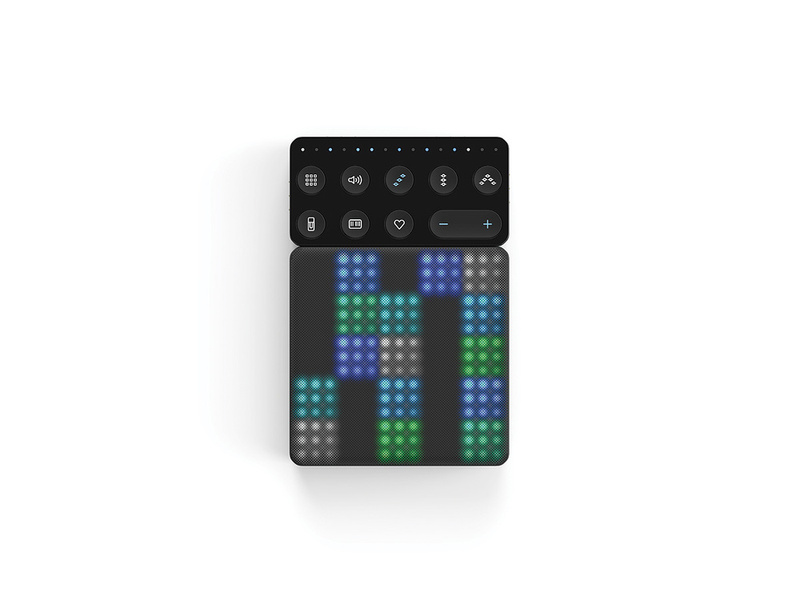 The Lightpad Block is a portable multitouch-sensitive keyboard surface with integrated display LEDs which links to the dedicated Noise iOS app, or to desktop software. The Live Block, Loop Block and Touch Block add controls for easier recording, performance and playback in Noise. The Seaboard Block is a miniaturised Seaboard RISE with no obvious compromises in build quality or playing sensitivity. Seaboard Block: £279.95, Lightpad Block: £169.95, Live Block, Loop Block, Touch Block: £69.95. Prices include VAT. Seaboard Block: £299, Lightpad Block: $179, Live Block, Loop Block, Touch Block: $79. Apple iPhone 6s, iOS 10.3.3. Apple MacBook Pro (Mid 2014), Mac OS Sierra 10.12.6.